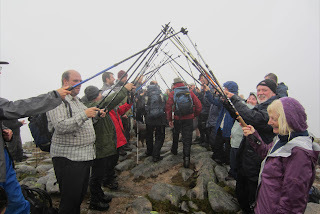 Mike & Jane joined a group of fellow members of the Austrian Alpine Club for a walk on Kinder Scout. Although the weather forecast was reasonable, the conditions proved to be somewhat 'wild', with high winds and frequent snow flurry's making walking quite a challenge! Despite it all we managed to successfully cross the centre of the plateau and descend an icy Grindsbook without incident. Well done to everyone who took part. Bookings are going well for the autumn round of Navigation Courses. This coming Saturday (8th Oct) is over subscribed with only 3 places being left on the next introductory course (22nd October). Full details of the current courses can be found on the Peak Navigation Courses website. Went up to Scotland last weekend to be part of Jim’s final Munro celebrations. As the rest of the UK was basking in sunshine we enjoyed the mist and rain of a Scottish monsoon! Already wet, we didn’t bother looking for stepping stones crossing the final stream. We are not usually given to drinking alcohol whilst on the hill but it seemed obligatory to have the Scotch that was being passed round on the summit of Beinn Teallach (which we reached after ascending Beinn a Chaorainn). Congratulations Jim! The evening Ceilidh was such good fun and it was great to meet up with everyone who came on the Integral trip last summer. There are places still available on this classic mountain walking week which takes in the best of Spain’s Sierra Nevada mountains. 10th to 17th September. This is a full board fully guided walking week with 6 days of guided walking. We meet you at Malaga Airport provide the holiday which includes 5 nights in a hotel, 2 nights in a mountain hut and aims to ascend Mulhacen which at 3482m is the highest mountain in mainland Spain. At the end of the holiday we return you to Malaga Airport for your flight home. 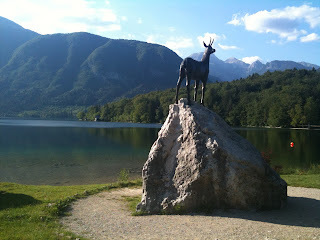 Following our successful visit to Slovenia’s Julian Alps, we will be introducing some holidays there into our programme for 2012. 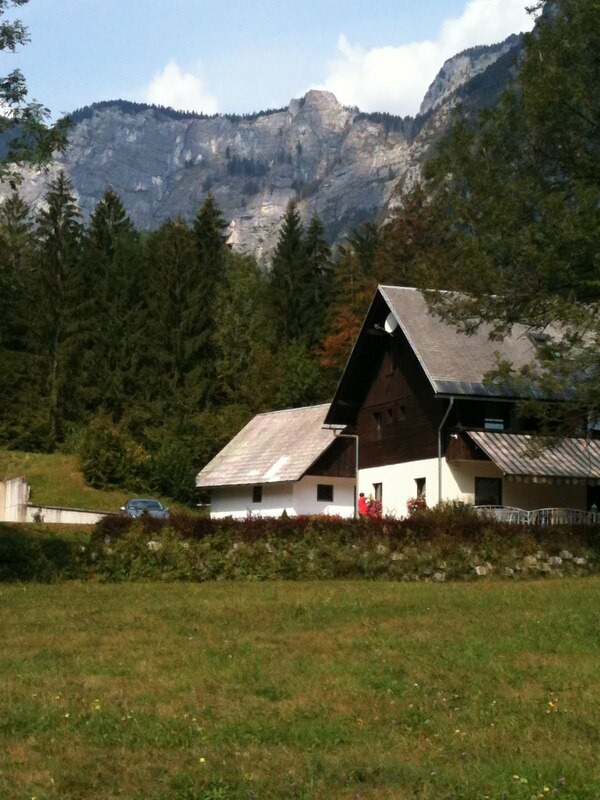 The spring flowers are at their best in the high alpine pastures at the end of May and beginning of June. It is a time when the Marmots come out of hibernation and can be seen in family groups with the young ones play fighting. As well as Marmots we were amazed to see Golden Eagles soaring above us and dropping into their Eyries. The classic alpine chalets of the high farms are wonderful and the people so friendly. We will be based in a traditional high village called Stara Fuzina just a few minutes walk away from Lake Boinj. Some days the walks will start from the hotel, though on a couple we will drive just a few minutes either to gain some height of to get to the other side of the valley. Our Winter and Spring programme of navigation courses has now come to an end. This year we have been busier than ever with more courses run and more students attending. It’s good too that we have made some good friends from those attending the courses and we look forward to the autumn programme that starts this coming October. It’s always good seeing people “get it” and discover that they can navigate, finding stone circles and obscure aircraft wrecks on the moors. This spring we had one of our very first students come back to us for some revision and night navigation practice before taking her mountain leader assessment. Needless to say she passed! The coming programme includes introduction, intermediate and advanced night time navigation. 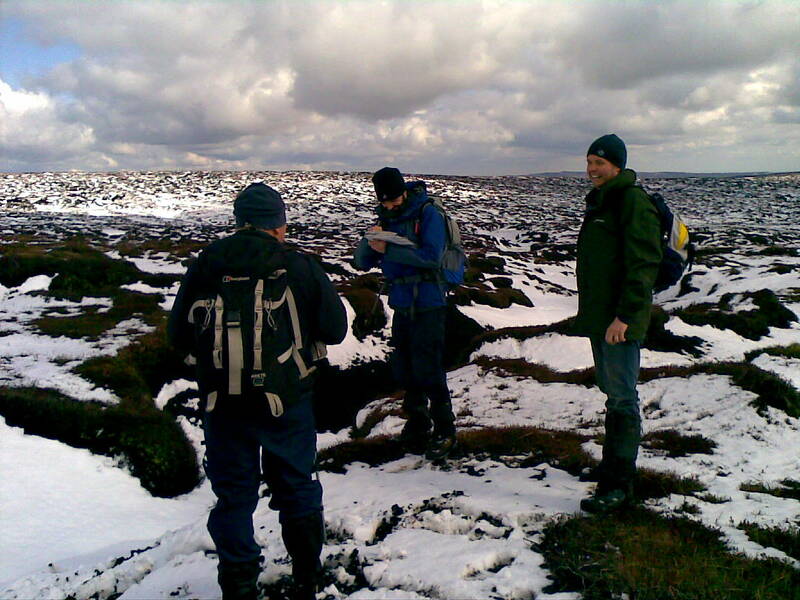 Details can be found at the Peak Navigation Courses website. This year we tried to give the walks descriptive names that would conjure up the spirit of the walk: A Kinder Experience; Delights of the Upper Derwent; Aircraft Wrecks, The Big One’s; etc. It was a successful couple of weeks where we made new friends and hopefully inspired clients to get out and join us on our holidays and navigation courses. Much praise was expressed to us for the way we made the walks enjoyable and even taught a few skills like using a GPS during one of the walks. Mike enjoyed every one of the 13 walks but thought using his compass and navigation skills during poor visibility crossing Kinder Scout to be a highlight. We are already refining our walks in preparation for the 2012 Peak District Walking Festival. Keep an eye out for next years programme and come and join us.